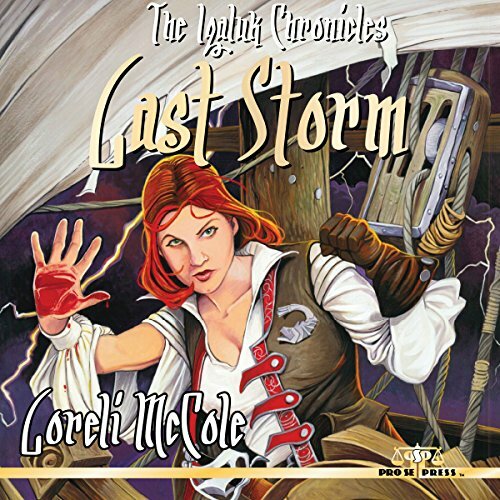 LORELI MCCOLE’S ‘THE IQALUK CHRONICLES: LAST STORM NOW AVAILABLE AS AUDIOBOOK! Author Loreli McCole’s debut novel and the first in a series, The Iqaluk Chronicles: Last Storm, from Pro Se Productions, is now available as an audiobook produced by Radio Archives. Blood on her hand, She vowed all she had and was, life and soul, to her ship, the extraordinary Iqaluk and her crew. Before the next voyage ends, the woman known only as Captain may lose every bit of that and more. Steampunk in nature but creative in its concepts, The Iqaluk Chronicles: Last Storm introduces the enigmatic Captain and her stunning craft, The Iqaluk, and a whole new world of action adventure from the mind of author Lorelei McCole. A world that faces a threat they have only ever read about in books suddenly needs someone to step up and fight for them. Captain has only just finished her first year in charge of her ship and has suffered and survived all the disasters that entails. But now she must figure out how to prevent war from coming to her home. And if she fails, her ship, her crew, and her very world may well be lost. The Iqaluk Chronicles: Last Storm by Lorelei McCole. From Pro Se Productions. Featuring a wonderful cover by Michael Hegedus and a riveting narrative performance by Michael Gilboe, The Iqaluk Chronicles: Last Storm audiobook is available now at Amazon at http://www.amazon.com/The-Iqaluk-Chronicles-Last-Storm/dp/B017HYAOHU/ref=sr_1_1?ie=UTF8&qid=1446613023&sr=8-1&keywords=The+Iqaluk+Chronicles%3A+Last+Storm+audio. It is also available on Audible at http://www.audible.com/pd/Sci-Fi-Fantasy/The-Iqaluk-Chronicles-Audiobook/B017HYBLDG/ref=a_search_c4_1_1_srTtl?qid=1446613072&sr=1-1 and will be available on ITunes as well. Print and digital versions of The Iqaluk Chronicles: Last Storm are also available at Amazon and other online retailers. For more fantastic audiobooks and more from Radio Archives, go to www.RadioArchives.com. RICHARD MONROE, SPY EXTRAORDINAIRE, GOES TO AUDIOBOOK! AARON SMITH’S NOBODY DIES FOR FREE NOW AVAILABLE! AUTHOR STEPHANIE OSBORN DEBUTS NEW HOLMES SERIES! SHERLOCK HOLMES AND THE MUMMY’S CURSE DEBUTS!